On the 15th August, the Orthodox Church remembers the death of Our All Holy Virgin Mary, Mother of God. This is preceded by a two week fast. 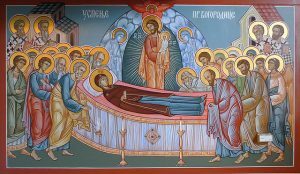 The Dormition of the Theotokos is one of the Church’s 12 Great Feasts. Sometimes known as the ‘assumption’, we commemorate death, resurrection and glorification of Christ’s mother. We affirm that the Theotokos died in the body, was resurrected by her Son, and was taken-up, body and soul, into heaven. The Great Feast of the Dormition of the Theotokos is a good example of the Church refers to as ‘bright sadness’. We mourn for the death of the Queen of Heaven. Our All Holy Mother is leaving us, and we cry out as all children do at the loss of their Matriarch. And yet we celebrate and are glad: Our Most Holy Theotokos is resurrected and sits besides the Throne of Her Son, where she intercedes unceasingly for our souls. Our Most Holy Theotokos Save Us!